While I’ve been going inward, and focusing on my beingness, making the most of April’s influx of energy… I was visited by a dragonfly who was kind enough to pose for me in this image of integration. Even though I do not have a telephoto lens, and I just took this with my camera phone, it’s a decent image. It’s easy to see it clearly! ❤ Feeling grateful and just wanted to share it! 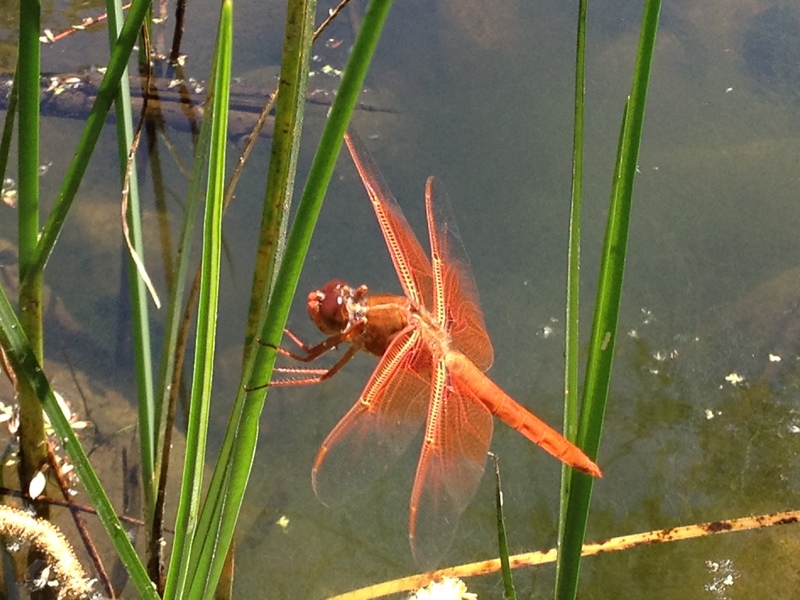 Adaptability & Transformation, riding the winds of change…dragon fly and i merge as one. magnificent! thank you for sharing this lovely moment here. BTW as I read your about blurb above, I realized I would like to also be doing most of the activites you described…. Thank you, Linda. I really appreciate your leaving a comment to let me know that you were able to share it with me. Oh, i love this!! I have been dreaming of dragonflies! Awesome pic! Wow. Those wings! How wonderful to have you posting again. How was the time away? I think it is somehow inevitable that you and Dragonfly should meet. And I’m certain that with your erudite mind and evolved soul you are already very much aware of the significance and symbolism of this encounter. Lady Dragonfly is incredibly beautiful. I had not appreciated how diverse the colouration of these masters of flight, speed, and balance can be, but never have I seen one wearing such a sun-drenched cloak of lustrous amber. She is a heavenly jewel. Thank you for your thoughtful comment and your own erudite mind! It was great 🙂 I like to take time away! It’s a really nice picture, especially with your camera phone. I always take dragonfly and butterfly visits as a sign. The other day a hummingbird cam about a foot from me and hovered. It was looking for a flower and I had on pink, but it was cool. Thnx, Sindy 🙂 Thank you for your visit! It’s like a blue butterfly just visited the dragonfly. One of my friends has a hummingbird totem, and once she called me and told me that her spider totem and hummingbird totem were hanging out! A spider was hanging out by her bird feeder, and she was wondering about their communication. They were acting like they had a message. It’s unique for each of us, and yet it’s universal. That is like a zen koan, no? I experience Hummingbirds as having light and happy energy. What a gift! Thank you for sending me this link, showing it to me. I'm marinading in your story. I'm glad that we can connect in this way. When we first moved to our home here in San Diego, our first stop…our first night…my husband and I found ourselves in an entire field of Lady Bugs! I wanted to walk to the baseball field and just lie down like a starfish on the beach. BE. To my surprise, I never saw so may Lady Bugs before in my life! The batteries on our camera phones went dead. No taking of pictures. This experience was full immersion. Now, we're coming right around to our first year anniversary here, and in a couple of days, we will be flying to the East coast for a visit & more reconnecting. Thank you for following the link. Wishing you dragonfly and ladybug sightings back East… Blessings.